A large-scale study of languages shows that the grammar of creoles - which emerged in multilingual situations of extreme social upheaval, like colonial slaveries - are composed from the grammars of other languages that preceded them rather than being innovated from scratch. The study, published today in Nature Human Behavior, analyzed a large number of creole and non-creole languages to reveal the robustness of language transmission processes. At times over the last several hundred years, large groups of people speaking completely different languages have been forced to communicate. One striking example of this is, for instance, when people from different regions of Western Africa were enslaved and forced to work on sugar cane plantations on Caribbean islands. The individuals brought together in this manner spoke many different languages often completely unintelligible to each other. Yet, over time their descendants came to speak a single language - a creole language. Creoles emerged in very different parts of the world - from the Caribbean to India and the Pacific islands. Intriguingly, some aspects of their grammars are remarkably similar. For instance, most creoles order words in sentences in a sequence that linguists describe as Subject-Verb-Object (as in English: one cheetah [subject] chases [verb] the gazelle [object]; or, The general [subject] planned [verb] the attack [object]). Why are creole languages similar? Consequently, the hypothesis goes, the characteristics that all creoles share reflect this pidgin stage. Why? Some scientists have conjectured that this is because pidgins reflect the simplest possible solution for communication. Aspects of languages that do not contribute to or that interfere with efficient communication - such as the gender systems in French and Italian, or the usage of completely different words to refer to the same action in different tenses, like English go/went - are not carried over by pidgins, and hence do not feature in creoles. Others have speculated that pidgins turn into creoles by means of an innate, biologically-grounded "grammar blueprint." While many linguists (prominently, Noam Chomsky) believe that humans are equipped with an innate exceptional faculty for acquiring language, the idea of a grammar blueprint suggests that humans are also endowed with a "default" grammar in addition to this faculty. When children are exposed to a full-fledged language they will acquire it, but when they are presented instead with a poor and simple communication system like a pidgin, they will "fill in the gaps" and come up with new pieces of grammar that come directly from the grammar blueprint, thus giving rise to a creole. If this was the case then creole languages would be similar simply because they reflect this grammar shared by all humans, an outstanding piece of evidence about the evolution of language. 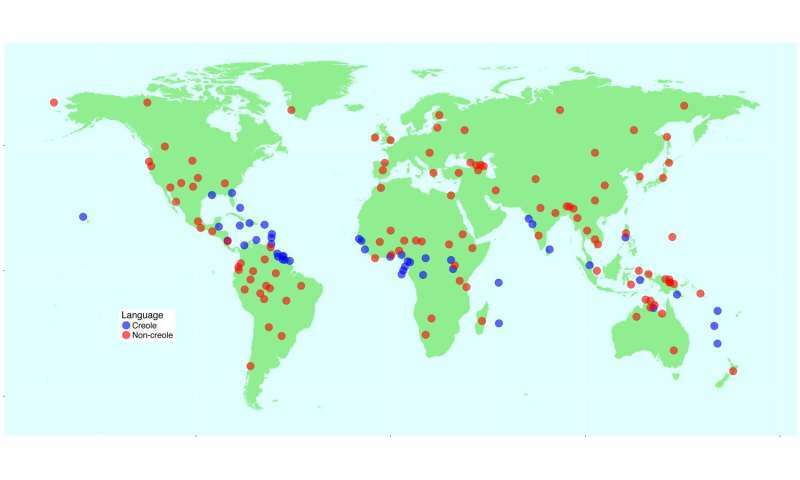 Researchers from the Max Planck Institute for the Science of Human History, Leipzig University and the University of Zurich analyzed a large database of grammars composed of both creole and non-creole languages, using a combination of linguistic knowledge and machine learning techniques. The results reveal that creole languages in different parts of the world retain many of the grammatical patterns of the languages spoken at the time of their emergence. When creoles share the same properties across the board, it is because the other (non-creole) languages also possessed those properties - the Subject-Verb-Object order, for instance, is also present in the vast majority of languages from which creoles took their vocabularies. Hence, beyond the fact that creoles result from the mixture of other grammars, they are not essentially different from the rest of the languages of the world in that most of the time they maintain the linguistic structures present in the generations that preceded them. 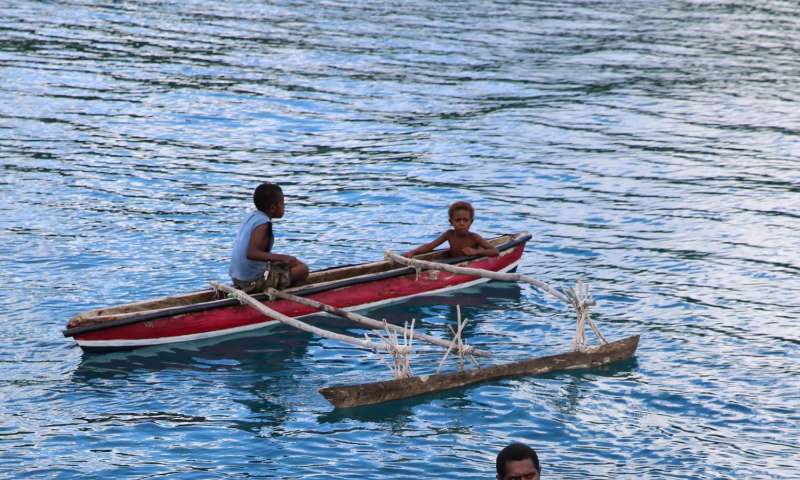 "Creole languages look deceptively similar, but now that we know more about the world's languages, we see more and more features that were inherited from African, Asian and European languages," says Susanne Maria Michaelis, a researcher at Leipzig University and the Max Planck Institute for the Science of Human History. Martin Haspelmath, also at the Max Planck Institute for the Science of Human History, adds: "What this means is that there is no evidence for a pidgin stage in the history of these languages." The fact that these results put to rest the idea of the pidgin stage in creole languages is not their only important feature. "To me, the most surprising result of our investigation is the realization that languages are transmitted in an extremely robust manner: many creoles emerged from situations like slavery or trade posts, which seem particularly difficult for learning languages," comments Damián E. Blasi, a scientist at the University of Zürich and the Max Planck Institute for the Science of Human History, and lead author of the study. "Nevertheless, we humans are extremely good at preserving and learning all sorts of complex behaviors like musical traditions or marriage patterns, and this study shows that language is perhaps the most outstanding proof of that ability."